The issues chasing Ray Allen out of the Boston Celtics and into the arms of their most despised opponent stacked higher and higher, and suddenly everything crystallized in the hours basketball’s most persuasive recruiter, Pat Riley, captivated him. The emperor of the Miami Heat sold Allen on never hearing his name in trade talks and a run of championships awaiting him. After all these years, Allen needed to feel wanted again, needed the recruiting, and Riles had such a willing soul sitting with him in the breeze blowing over Biscayne Bay. "He felt he was getting respect that he hadn’t gotten from [Celtics president] Danny [Ainge] and [coach] Doc [Rivers] anymore," a source close to Allen said Friday night. "…The presentation was incredible." Respect comes in different ways, but make no mistake: The Celtics had offered two years and $12 million – respect for someone's who's 37 and coming off ankle surgery – and it didn’t matter to Allen. He hated the way Ainge dangled him in trade talks, hated that the Celtics told him he was on his way to Memphis in a deal at the March deadline only to have Rivers later tell him the trade was dead. Allen hated that Rivers didn’t give him his starting job back after he returned from a late-season ankle injury, and hated that it always felt like he was the Celtics star made to sacrifice above the rest. Ainge and Rivers talked to Allen over and over on these issues in recent weeks, tried to smooth over the lingering bitterness, but there was something that Allen couldn’t move past, something he no longer wanted to deal with – the deterioration of his relationship with complicated point guard Rajon Rondo. And with all of this cobbled together, with the sudden lure of sun-drenched golf courses and Riley’s pitch and a three-year, $9.7 million contract that could easily bring him two or three championships, Allen made a monumental move. He’s leaving for Miami, and the Celtics-Heat rivalry – the Ray Allen Celtics' legacy – are changed forever. Kevin Garnett recruited Allen harder in the final weeks than Paul Pierce did, sources said, but both made it clear: Our run isn’t over, Ray. Come on back where you belong, and let’s get back to work. The Celtics were bringing back Jeff Green, had signed Jason Terry, drafted Jared Sullinger, and the franchise was selling Allen a scenario where the curtain hadn’t dropped on its championship aspirations. This wasn’t Steve Nash leaving a losing lottery operation in Phoenix that didn’t want him back anyway. This was Ray Allen leaving the Celtics in the middle of a full reload, the bolstering of a roster to make a run at the Heat again. This was Ray Allen offered more money, not less. And yet for those in New England daring to call it treason, well, Ray Allen will call it something else: My turn. For all the past indignities – real or imagined – Rondo was the issue that hadn’t gone away, that would still be there come training camp. They don’t like each other, and it had become a bigger and bigger drag on Allen, sources said. Each had culpability for why things had gone awry, and yet each was better on the court because he had played with the other. Rondo has had a polarizing impact within the Celtics' locker room, and his relationships with teammates and coaches have fluctuated over the years. Allen and Rondo never had arguments this year, never got into it. In fact, one source said: "Ray mostly ignored him." After the season, Rivers tried his best to mend the relationship between Rondo and Allen – make it manageable on some level. And yet, as one source with direct knowledge of the coach’s efforts said, the relationship was "too far gone." Whatever the issues, everyone agreed: Rondo and Allen never brought them onto the floor. They played together, played well, but Allen had grown increasingly disillusioned about dealing with the disconnect. 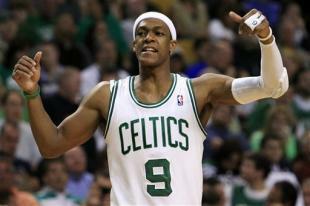 The friction started in the 2009-10 season, after Rondo signed his five-year, $55 million extension, sources said. It wouldn’t be long until Allen started to hear his name in trade talks, and he began to make the correlation that Rondo’s salary played a part in the Celtics looking to trim payroll – starting with Allen. "Ray is prideful," one source said, "and he was always wondering: 'Why do I have to be that guy?' "
Those were some of the conflicts that Allen had with Rondo, but the stubbornness of the point guard worked to exacerbate everything. Rondo and Allen were non-confrontational, but much of the behind-the-back sniping to teammates and those around the team took a toll. So much of it was sandbox stuff, the kind of grating, ultimately petty issues that occur in every locker room, every workplace. Rondo didn’t chase Allen out of Boston, but their relationship did become a drain in the locker room. Their cold war was something Allen discussed with associates, something that became a concern of management and the coaching staff. "When it comes to basketball, Rondo is the smartest player on the team – one of the smartest players in the league," one locker-room source said. "And Ray considers himself a smart guy. But at some point, it became hard for Ray to be corrected by a guy so much younger than him." No one ever blamed Rondo, and no one blamed Allen for it. This happens in sports, happens everywhere. As one staff member said: "In a lot of ways, they’re polar opposites. Ray is a military child, has the ultimate respect for authority. He does everything hard every day. Rondo’s different. He’s a free spirit. He’s unbelievably bright. But when Ray is taking everything seriously, Rajon can be lackadaisical. Doc has done a tremendous job coaching him, and he's gotten better every year – but there’s still a big difference between them." Some believe it was pure jealousy on Allen's part, too, that he had blame for the disconnect. Within the Big Three, they teased Allen for his political nature. Whereas Rondo, Pierce and Garnett would speak in brutal, honest terms, Allen was forever measured, even. He was a military child, a relentless worker, a player who found great comfort in the daily routine of his shooting and conditioning. Yet eventually Rondo’s greatness expanded the Big Three to the Big Four, and Allen’s next contracts with the Celtics were paid on a different scale than Rondo, Garnett and Pierce. In so many ways, the Celtics were perfect professionally and personally for Allen. He would be remembered as a legend in Boston, a part of a renaissance time for the franchise. He broke the NBA 3-point record in the Celtics uniform, won a championship, reached Game 7 of another NBA Finals, and maybe could’ve even had his No. 20 retired in the rafters someday. Allen kept a house in Connecticut, an hour from Boston, and his child’s medical condition had his needs met within the city limits. Someday there would be a Hall-of-Fame induction ceremony for Allen in Springfield, Mass., and his would be such a New England storybook. And with all that there, to still walk away for the Heat for $3 million less a season – after the Heat beat Boston on the way to an NBA championship – well, it was stunning to people. Within the Celtics, they knew this was possible, but were still jarred when informed of Allen’s choice. It hit everyone. In the worst possible way, Ray Allen wanted out of here. As much as he was validating his desire to play in Miami, there was a repudiation of the Celtics, and that hadn’t happened in this era. Allen has suggested to people that the capital he built in three years at Connecticut and five with the Celtics would transcend the cries of betrayal and boos. Allen has never been the enemy, the bad guy, and it will hurt him in New England. The Celtics weren’t breaking up the team and letting him leave. He took less money and hopped to the defending champions. He’ll take his hits, but as one organizational source insisted: "There's no mentally tougher player in this group than Ray; an absolute laser focus. That's why he's able to hit all those shots late in games. Physically, there are tougher guys. Not mentally tougher, though." When Allen left Miami on Friday, the Heat were unsure they had convinced him. He’s hard to read. They knew he’d fly home to New England, think it over, and it would still be so difficult for him to extract himself from the Celtics. Whatever the allure to Allen, his DNA was still made of loyalty and routine, and that still had to give Boston an edge. Yet, it turns out Allen's trip to South Beach made him feel so wanted, so inspired, and, truth be told, so eager to stick it to the Celtics. He could've broken Boston's hearts and left for anywhere, but clearly there’s a part of Allen that wants to exact some kind of revenge on the Celtics. There was nowhere else to do that but Miami. He will take far more grief, far less money, and that methodical, disciplined mind of Allen processes everything and still – still – he signed up with the Miami Heat. Allen had grown up on military bases around the world and has lived a most disciplined life, forever weighing the plusses and minuses – and always, always the consequences. Allen had a chance at the cozy, New England storybook ending, punctuated with that placid, poignant Hall-of-Fame ceremony in Springfield, where a favored son of Massachusetts would let the love and cheers wash over him. Maybe Garnett would've gone out with him, and they could've gone into the Hall, into the Celtics' rafters, together. And then, Pat Riley walked into the room, and all hell broke loose in Boston. Allen thought long and hard, and his decision was unmistakable: He was busting out of Boston on his terms, and it cut the Celtics most deeply. Complete and utter repudiation. My turn now, Ray Allen was telling the Celtics. My turn now.